Its quiz time folks! Tell me what is common to 1 Cor 10:4, Jude 1:9 and Jude 1:14? 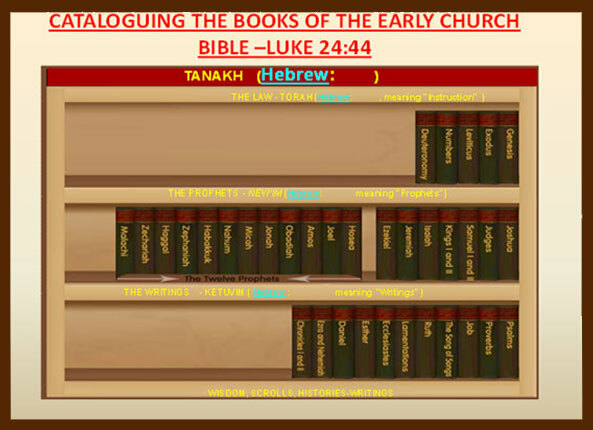 Well, they are accounts from Jewish Tradition, which we may not find in the corresponding Books of Exodus or Deuteronomy or Genesis respectively (where the related events could have most probably figured) but what the Inspired NT Writers� included wisely in their Epistles by the leading of the Holy Spirit so much so they now figure in Sacred NT Canon. �Then he said to them, �These are my words that I spoke to you while I was still with you, that everything written about me in the Law of Moses and the Prophets and the Psalms must be fulfilled.� (Luke 24:44). Note the order in our Lord�s words, it is NOT Law, Psalms and Prophets as it is available in our Christian Bibles today but a slightly different order. Let me �assuage� your confused minds as to the right order of OT Scriptures as it existed during the First century AD in the Early Church and exists even today amongst the Jews. 2. 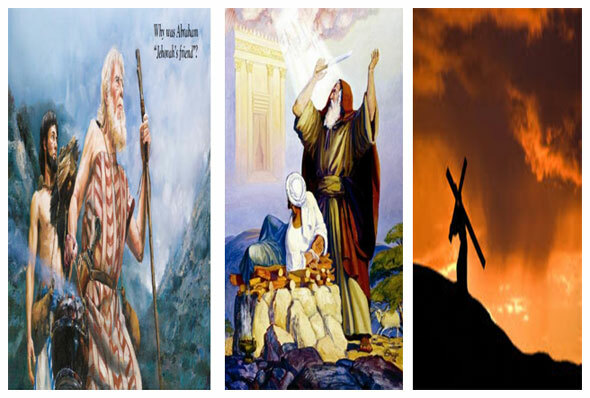 Prophets: Joshua to Malachi �It needs to be said here that the word �Prophecy� has to be understood in the way Jews and the Early Church understood it. For them Prophecy was not only foretelling but also forth telling! Hence Books of Daniel and Lamentations which appear in the �Prophets� section of the Modern-day Christian Bibles�, despite containing prophecies were not placed in the Prophets� section but in that of Writings for the simple reason they do not contain anywhere in their contents the authoritative, powerful figure of speech �THUS SAYS THE LORD� which distinguishes a Prophecy from other forms of speech (a praise or prayer) in the Scriptures!!! The Living Bible gets it right when it comes to exactly defining the function of a Prophet. Let me reproduce here verbatim, a part of 1 Cor 12:28 which goes thus�Here is a list of some of the parts he has placed in his Church, which is his body: Apostles, Prophets�those who preach God�s Word, Teachers,�. Has not preaching been all along all about foretelling and forth telling? If 2 Chronicles had continued to be the Last Book of the OT Scripture till the order was needlessly revised presumably during King Constantine�s time in 4th Century AD, one would have seen a beautiful symmetry existing vis-a-vis the last portion of the last Book of OT Scripture and that of the NT Canon. Now what is the immediate overarching subject of the last Book (Revelation) of N.T? RAPTURE�ah the Blessed hope of every Christian (Titus 2:13) which is alluded to in the command given to John at the sound of something resembling a �trumpet blast� � �COME-UP� (Rev 4:1/ 1 Thess 4:16)!!! Now as we �bring to the table� as it were, the last words of the last Book (II Chronicles) ��GO-UP� (2 Chronicles 36:23-KJV) an enchanting symmetry comes to the fore!!! What Cyrus the Persian ruler (who is issuing the Decree of Direction to all the Jews) is effectively telling the Jews is (NT counterparts of OT times)...�GO UP to the Holy City of Jerusalem on a mountain for you DO NOT BELONG HERE in Babylon (geographically Babylon is a plain, flat as a pancake) rather you belong to the Holy City of Jerusalem up on a mountain. Your God in His Holy City is calling you�COME-UP�!!! Has not the World been telling the same of the Church, more so in recent times with violence and moral degradation on the increase�you DO NOT BELONG HERE in this �Earthly Babylon� even as our Redeemer is on the verge of issuing the �Come-up� command? A young girl who had recently become a Christian asked the famous Baptist Preacher Charles Spurgeon��What friends do I need to give-up now�? The Prince of Preachers replied�Hey, you do not have to give up any of your friends, they would give you up� (I Peter 4:4)! Hmmm...it's Lenten season and with Good Friday fast approaching, invariably our attention turns to Genesis 22. Going by the description of Issac as a �Lad� in Genesis 22:5, one (read all Christians�) would normally assume that Issac was perhaps a young boy or at best a teenager but never a 37 year old typifying Jesus who too in his thirties carried the wooden cross to same place where 137 year old Father Abraham (portending the Heavenly Father) had led �his beloved son� to, about 2000 years earlier to be �sacrificed�. Hey�Issac �rose again� (Heb 11:19 TLB), so would the Son of God!!! Oh yes coming to the right age of Issac�all of 37 years. The Hebrew word �Naar� used to describe Issac as a �Lad� (Gen 22:5) is a relative term used to address someone who is very much younger to you though the latter by himself/herself may be an adult then. Mind you, Issac was younger to his Father by a good hundred years (Gen 21:5)! In yet another melodramatic Scripture portion as Gen 22 (Note:The good Lord always places two witnesses to underscore His point- Deu 17:6) we see a frantic elder brother Judah addressing his �held for ransom� younger brother Benjamin (born in Patriarch Jacob�s old age- Gen 44:20 -as such, much junior to Judah) as Naar not once but seven times (Gen 44:30-34) at a time Benjamin himself was a father of ten sons (Gen 46:21)!!! Thanks to Archbishop Stephen Langton dedicated efforts, The Bible was divided into Chapters in the 13th Century AD facilitating better navigation through the Scriptures and its subsequent teaching thereof but thematic division style which Langton adopted would sometimes have us believe that there is a considerable time gap between two consecutive Chapters like the one between Chapters 22 and 23 of Genesis which was not the case, all the time. We see at the very beginning of Chapter 23, Sarah who had given birth to Issac at the age of 90 dying at the age of 127 in Hebron (presumably taking care of one of many cattle-breeding farms of the family therein) and Abraham �coming over there� to mourn for her, as evidently he had been at �a different place�. Incidentally from one of the Cattle-breeding farms at well-watered Beersheba Abraham had gone to Mount Moriah and had returned there after passing his �fiery test of faith�. Thus the Sages teach that Issac was not a little kid but all of 37 years at that defining testing time in his life acceptance of which would make the Christians� better appreciate the comparison between Issac and Jesus who too in his thirties carried the �wood voluntarily on his shoulders� in full obedience to His Father�s instructions (Gen 22:6/ John 6:38/ John 19:17). Bye, Bye theory that Israelites were �caged� in Egypt for 430 years (theory most of us have stuck to from our Sunday school times� erroneously) when in fact they stayed there for only for 215 years. Life Application Bible has come-up with a pre-cautionary footnote on Exo 13:40 stating 430 years as per the Original manuscripts is the total period of stay in both Canaan and Egypt and not only in Egypt. A closer scrutiny of �Sage� Paul�s observation in Gal 3:17 courtesy his solid training in OT History under a respected Rabbi Gamaliel (Acts 5:34/ Acts 22:3) would once and for all shatter the myth that Jews stayed in Egypt for 430 years. 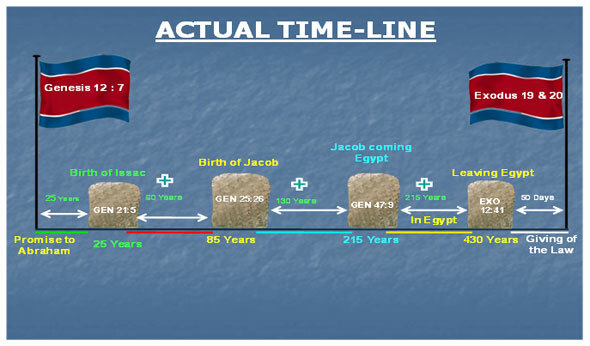 He points out clearly that the time gap between the Abrahamic Covenant and Sinai Covenant was 430 years and not the stay of the Jews in Egypt which was limited to only 215 years from the time Jacob landed in Egypt at the age of 130 (Gen 47:9) with his sons. 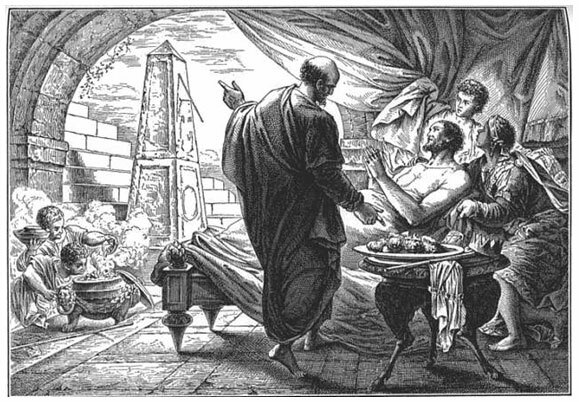 Apply fig paste on your boil (presumably cancerous) and bandage it up and everything is going to be fine said Isaiah or something pretty close to this effect (2 Kings 20:7) to visibly shaken-up but fervently praying King Hezekiah to whom, the former had just prophesied grimly that death was imminent. Now fast-forward to Matt 1:10 which whilst giving the genealogy of the Messiah from the Davidic line makes a mention of Hezekiah and also his son Manasseh. We know that Manasseh was born to King Hezekiah 3 years after his miraculous recovery and subsequent extension of life by 15 years (2 Kings 20:6/ 2 Kings 21:1). So how can King Hezekiah succumb to cancer for that would mean end of the Messianic line (God forbid) is the question which ought to ring loudly in our minds!!! It would take the Sages to tell us the truth!!! Sages teach that when virtuous King Hezekiah was foretold by the Holy Spirit that his son Manasseh would be very wicked (we know how wicked Manasseh also later repented- 2 Chro 33:1-13), the Regent to forestall the birth of a wicked progeny adopted a holier than thou attitude refusing to marry whereby breaking the very first commandment (Gen 1:28) of the 613 Laws contained in the first five Books of the Bible. No wonder the good Lord had to use some arm-twisting tactics to get him on track (marry�in fact, Hezekiah married Isaiah�s daughter) in order nothing goes amiss in greater sovereign redemption plan of His for the World (John 4:22). As Apostle Paul points out in 1 Cor 10:4, there was indeed a moving rock typifying Christ during the travel of the redeemed Jews through their Wilderness journey providing them with refreshing water all along in their 40 year sojourn. My correspondence with the Rabbis� enlightened me of the fact that the Rock after the Jews reached the Promised Land slowly descended into the Sea of Galilee (in northern portion of Israel) and disappeared (in NT we see that Jesus ascended and disappeared near Southern Bethany after making provision for the Living waters- John 7:37/ Acts 1:9). Truth be told, Trinity was in operation during the Wilderness journey. What a privilege for the Jews! 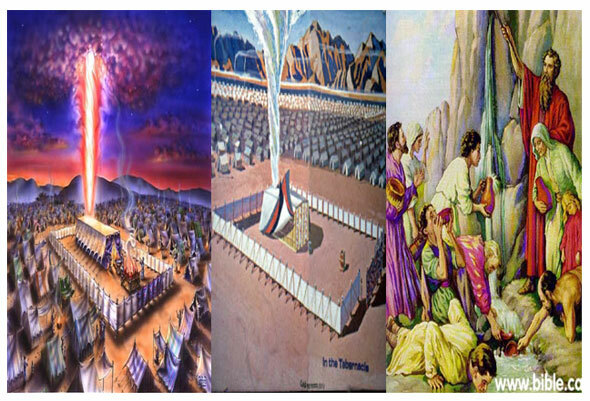 The Father�s presence was there by way of Pillar of Cloud during day time and Pillar of Fire during nights providing the Jews not only the needed direction (Exo 13:21-22) but also necessary shade during the sweltering heat of the day and the needed warmth in the chilly desert nights. 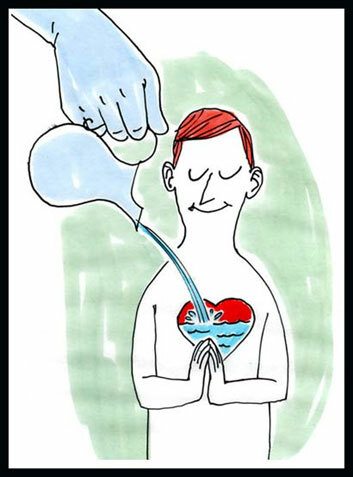 While the moving rock symbolized Christ, the refreshing water which flowed from it typified the Holy Spirit (John 7:37-39).